Yes one machine which can be set to 3 different working widths, 650mm, 750mm and 850mm and all at the flick of a simple lever. This doesn’t even need tools – anybody can do it at any time. You want it wide – fine… you want it narrow – 30 seconds is all that it takes. In many applications changing circumstances change specific needs so with Vario you can vary the specification to suit your exact requirements. It’s not only the working widths that can be changed, it’s the operating performance that is under the drivers complete control – cleaning speed, brush speed, water flow, chemical mix …you name it and you control it. Whatever you may be told, every application is quite different for many reasons – but trying to second guess the final specification in advance is not an exact science and not that easy. With the Vario you have so many factors that can be varied or preselected to suit any given situation or any changing circumstances. You really are “master of all you survey”. Once trials have been completed and operational settings determined, the Vario can be programmed to include a series of PRESETS which will allow different settings to be added to the memory, all of which can be retrieved at a simple push of a button as required. 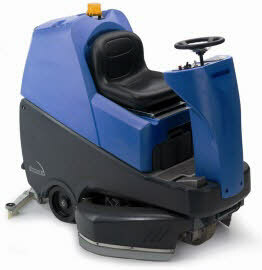 In addition to the extreme versatility of performance, there is a selection of brush and pad specifications to suit different needs and additional battery packs to extend the cleaning range as required. Yes, this is the range of One with more features and versatility of operation than you could possibly imagine – maybe we should have called it the Range of 101.